New music, vids, artists & the approaching New Year! There is heaps going on for Slice at the moment. New music, new videos, new artists to be announced on the label and and a kickass NYE event to look forward to! We will be bringing our Merkaba Structure to act as the electronic stage at Tanglewood Music & Arts Festival this NYE in all it's psychedelic geometric glory! Ear Mind Eye is a Dark Psy/Tech project on and a VJ on Slice Records who has been working on some new tunes and visuals to get you moving in preparation for Tanglewood and also playing there will be The Scullamooks - check out their new video "The Newer Mythology. Don't forget to subscribe to our new Youtube channel for updates on new film clips and live footage! 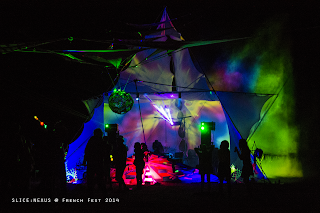 We will be at Tanglewood Music & Art's Festival this NYE in Thornton with the French Fest Crew! There will be so many different styles of music, such as acoustic, blues, Funk, Folk, Reggae, rock n roll, metal, hip hop, electronic, drum n bass, psytrance, techno, ambient, some breakcore and some fresh underground electronica to top it all off. There will be local food stalls, homemade crafts, educational, cultural and permaculture workshops, amazing original production and lighting, roaming performers and heaps of smiling happy people, with a strict No Dickhead policy. Check out the ripper lineup, great headliners and get some tickets!